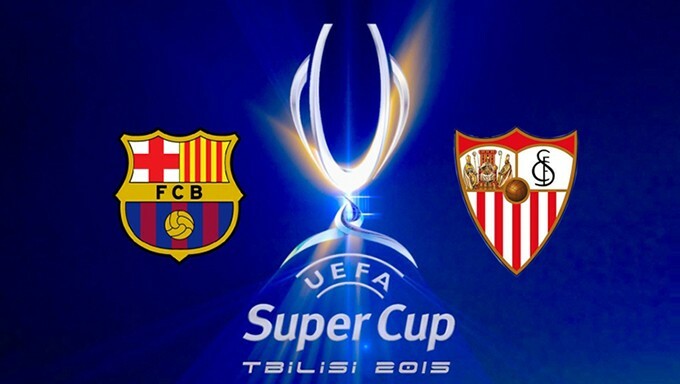 The 2015 UEFA Super Cup takes place in Tbilisi on August 11th and this year's game is a particularly intriguing encounter: Barcelona against Sevilla. In a repeat of the 2006 Super Cup clash, Luis Enrique's Champions League winners will take on Unai Emery's Europa League champions. Unsurprisingly, Barca are strong favourites to triumph in the Georgian capital at 4/11 with Betfred Sports. The Catalan giants are one of the dominant forces in European football and possess arguably the most devastating forward line-up in the world. However, Sevilla (currently priced at 7/1 with Ladbrokes Sports) will only have to think back to their famous Super Cup victory in Monaco nine years ago for some inspiration. Back then, Sevilla had one of the finest squads in their history (a group that included Manchester City's Jesus Navas and current Barcelona star Dani Alves) and they stunned the side that was then managed by Frank Rijkaard by recording a 3-0 victory. The likelihood of that scoreline occurring again is rated at a huge 125/1 by Coral Sports – but stranger things have happened in football. Punters looking for a different correct score bet may like to see if there are any trends to be followed from the other Super Cup matches of recent years. Three of the last five games have finished with a 2-0 scoreline. A repeat of that result in Barcelona's favour is priced at 7/1 by Bet365 Sports, while Coral Sports is offering 60/1 on 2-0 to Sevilla. Many fans will remember the 2012 Super Cup, when Radamel Falcao scored a hat-trick for Atletico Madrid in a 4-1 demolition of Chelsea. Those expecting Barca to be similarly dominant in Tbilisi can get odds of 16/1 at Ladbrokes Sports on the same scoreline in the Catalans' favour. With so much attacking talent in both squads, the Super Cup goalscorer markets are sure to be popular among football betting fans. Lionel Messi is favourite to be first goalscorer at 11/4 with Coral Sports (8/13 to score at any time), while his team-mate Luis Suarez can be backed at 7/2 (10/11 anytime). A Messi hat-trick is priced at 8/1 by Bet365 Sports, with the same bookmaker offering 12/1 on a three-goal haul for Suarez. Sevilla are currently adjusting to life without star striker Carlos Bacca, who was sold to AC Milan in the summer. Without the Colombian, much is expected of French international Kevin Gameiro, who moved to Sevilla from Paris Saint-Germain in 2013 but has only now been entrusted with the number nine shirt. He is priced at 10/1 by Ladbrokes Sports to score first in this year's Super Cup clash. Alves is not the only former Sevilla player in the Barcelona ranks. Ivan Rakitic made the move to the Camp Nou from Andalucia last year after captaining Sevilla to victory in the 2014 Europa League final, when they beat Benfica on penalties. The Croatian midfielder is rated at 10/1 by Coral Sports to score first when he faces his former club and 7/2 to score at any time. The Super Cup is the kind of event that attracts plenty of neutral fans and many will be hoping for a game that provides excitement. The momentum could shift several times throughout the 90 minutes (and extra time if the scores are level), although it seems likely that Sevilla will have less ball possession and aim to catch Barca out on the break. This makes for a lucrative half-time/full-time market. A draw at half-time and a Barcelona victory at full-time is priced at 3/1 by Bet365 Sports, while Barca winning at half-time and Sevilla levelling up the scores in the second period can be backed at 20/1 with Coral Sports. For those expecting the underdogs to steal a surprise win, a draw at half-time and a Sevilla victory at the final whistle is available at 20/1 with Bet365 Sports.